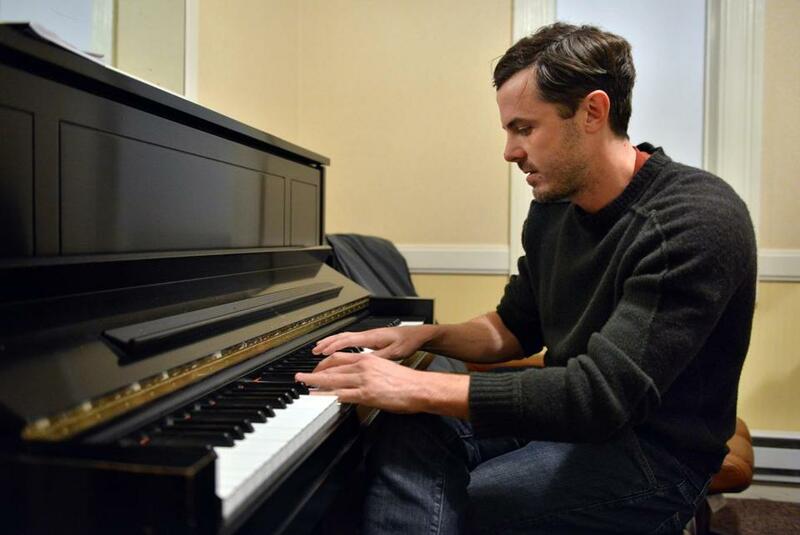 Casey Affleck played piano in a practice room at Symphony Hall before a Boston Pops fund-raiser last week. When we sat down with him at Symphony Hall the other night, Casey Affleck was pale and wobbly. “Give me a hug,” the actor said, getting up slowly from a piano bench backstage. “I can’t shake your hand, I have the flu.” Affleck, who was there to narrate “‘Twas the Night Before Christmas” with the Boston Pops, had just come from the set in Chatham of “The Finest Hours,” Disney’s telling of a dramatic Coast Guard rescue off the coast of Cape Cod in 1952. “It’s been so cold, and with rain machines and the period costumes...You know, they didn’t have waterproof stuff back then?” he said, coughing. But he’s not complaining. Affleck said it’s been the rare movie shoot he wishes would continue. “One of the best,” he said. “Chris Pine, Ben Foster, we’ve had a blast.” Affleck then turned around plinked a few notes on the piano. “My wife plays, I don’t,” he said, referring to Summer Phoenix, with whom he has two children, ages 10 and 7. Raised in Cambridge, Affleck said he’ enjoyed being back in Boston, and it won’t be long before he returns. Ben Affleck’s kid brother told us he’ll be starring in director Ken Lonergan’s next movie, “Manchester-by-the-Sea.” Wait, we said, Matt Damon was supposed to be the lead, wasn’t he? “Yeah, but Matt can’t do it,” Affleck said. “And, you know, if Matt’s not in it, it’ll be good.” The actor then cracked a sleepy smile and played a little piano.